At a general meeting, the principe, the rectors, and the advisors assume their offices. The Accademia confirms and appoints the following officials: treasurer, proctor, appraisers, peacemakers, supervisors, visitors to the infirm, and administrators of foreigners. 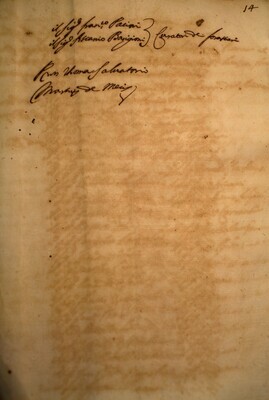 The document is damaged. 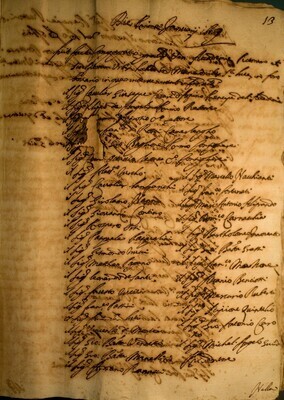 Brackets denote illegible passages due to holes in the paper or ink spots. "Pittori" refers to Girolamo Nanni and Antonio Tempesta. "Scultori" refers to Giulio Cesare Conventi and Pasquale Pasqualini. "Indoratori" refers to Fausto Luzio and Paolo Senese. 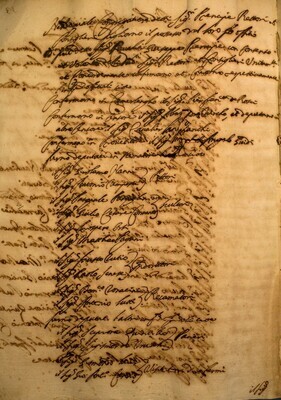 "Recamatori" refers to Domenico Tonacini and Giovanni Antonio de Lutti. "Pacieri" refers to Scipione Quintilio and Gismondo Traccia. "Visitatori d'infermi" refers to Siegmund Lair and Giovanni Antonio Carosi. "Curatori de forastieri" refers to Francesco Pacini and Ascanio Barigioni.